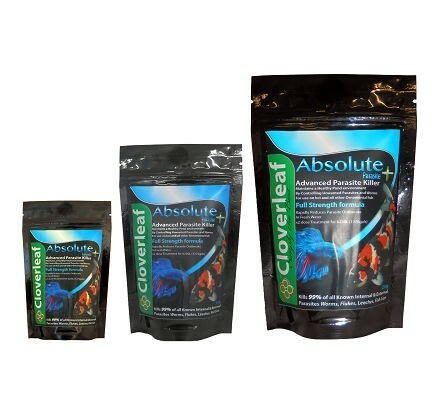 Absolute Parasite + is effective in killing outbreaks of skin flukes, Gill Flukes, Internal Worms, Trichdodina, Hexamita. These parasites cannot be seen by the naked eye. Absolute Parasite + will also kill larger parasites such as Anchor Worm, leeches and fish lice which can generally be seen on the bodies of the fish. Add 1g oer 50L (11 Gals)/20g for 1000L (220gals) repeat dose after 14 days simply desolve the required amount of absolute parasite ito water and distribute evenly. This treatment will work at any temperature. Switch off lights for 24 hours when using. In meters length x width x average depth x 1000 = Litres , divide by 4.54 for gallons. When using Absolute Parasite ensure plenty of oxygen is being provided. Switch off UVs and Ozone Generators and remove chemical absorbent media form filters such as activated carbon. Please Note: Keep all biological filtration running to maintain good water quality. This treatment will not harm beneficial bacteria. Absolute parasite is safe to use with salt in ponds. Uvs or ozones are safe to be switched back on 3 days after each dose. It is normal for fish to flash/rub jump after any parasite treatment.